BioniQ implant system | LASAK Ltd. The system philosophy emphasizes ease and effectivity. The implant system includes both cylindrical Straight and conical Tapered implants. Surgical instruments for all types of implants, including all diameters and lengths, in one cassette. 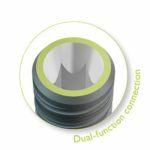 The horizontal and vertical set-off of the implant-abutment connection from the bone level, together with the implant mini-threads, contribute to the stability of the marginal bone and soft tissues surrounding the implant. Wide range of prosthetic components ensuring perfect esthetic results. LASAK launched BioniQ dental implants, in 2013, following its 20 years of experience of producing dental implants. The state-of-the-art surface treatment, brand new Q-Lock connection, optimized insertion, clear and practical packaging, together with other functional characteristics of the system have a single aim – to provide a unique set of advantages based on our own long-term research and development without compromising ease of use and cost-effectiveness.